I wouldn’t say that they were scary per se. But, try, after a week, to come to work and be greeted by pioneer Captain James Clarke and Port Moody’s first mayor, Perry Roe, and you would be startled too. Volunteer and board member Mary Anne borrowed the two photos, went to London Drugs and had them blown up to this size. She mounted them on plywood and Curator Jim Millar then affixed some stands to their backs. Clarke and Roe will be part of the Heritage Week 2006 display at Port Moody City Hall. 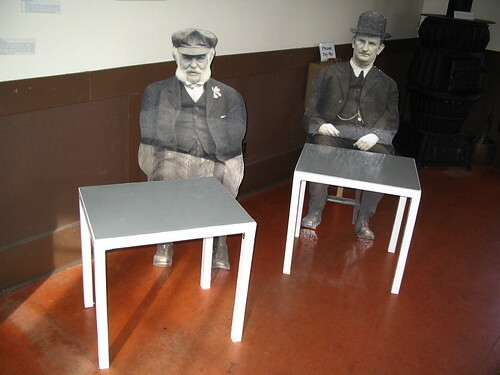 The Port Moody Heritage Commission will also invite the city councillors to come and take photos with the first mayor. Hello and what a hoot those 2 guys are sitting there. Hats off for the creative aspect, always a good sign in a local museum. I’m Perry Roe’s great grandson, and I think what ya’ll are doing is great!